Popcorn bags an excellent addition to your birthday party, carnival, fair, theatre, or party, use this fun popcorn bag to serve up hot, buttery popcorn. These superior quality bulk small paper popcorn bags box contains 1000 bags. 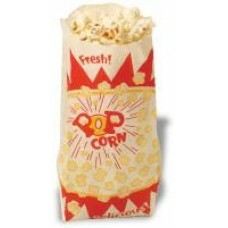 This is our most popular choice for Schools, our small bags hold 1 oz of popcorn.